With traffic congestion all day in many locations, cars are no longer able to offer the freedom to move we once considered them to. Our transport options today are resource intensive, inefficient, can have an adverse impact onto our quality of life, and are not sustainable in the medium to long term. 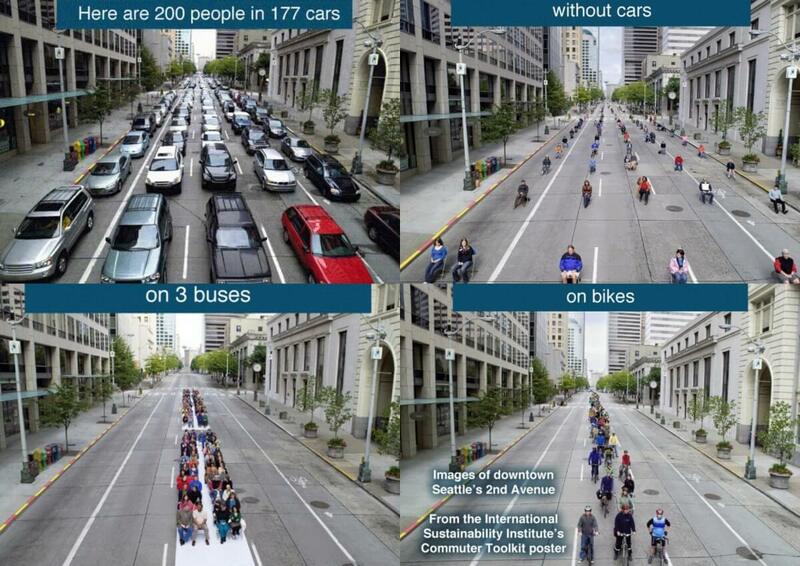 We need to be smarter about our transport options, this includes cars, public transport, cycling and walking. Better planning and facilitation of improved transport solutions in new residential subdivisions will create more livable communities and ultimately improve the value of an estate. There are a number of simple established design principles that improve transport options. Towns and cities work best when people can travel to a destination and once there easily walk between multiple destinations without the need for using other modes of transport (cars, buses, bicycles). Walkability relies on clustering a range of services and employment opportunities (not just retail) either centrally or in a corridor as occurred historically with vibrant retail dominated spaces (eg Smith St Collingwood or Glenferrie Rd Hawthorn), or mixed use spaces (such as around Burwood Rd Hawthorn). Locating employment destinations on the fringe of towns and cities by simple land zoning or re-zoning can utilize the spare capacity of our existing road network – cheaper than building new roads or public transport. Encourage local employment and radial traffic away from the city not just to the city. All planning schemes already include the following worthwhile clauses that relate to better and sustainable transport. The objectives of theses clauses should not be lost in the planning and implementation of new sub-divisions. The VPA has identified that a key objective for growth areas is to develop healthy communities. Local amenities and facilities will be connected by explicitly planned walking and cycling facilities. The resultant opportunities will encourage more people to walk and ride as part of their everyday lives. Off road shared walking and cycle paths are planned for all future arterial roads. 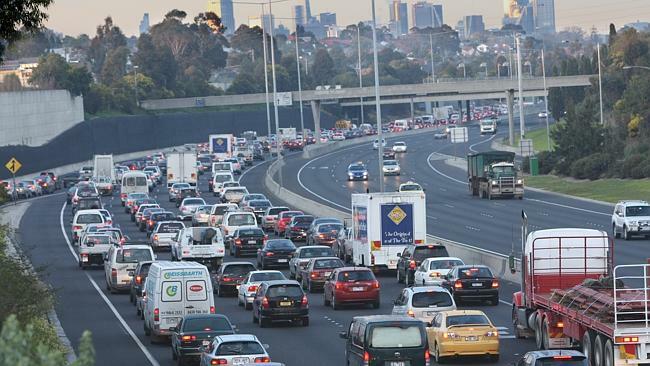 Vicroads policy is currently being developed in relation to arterial roads. 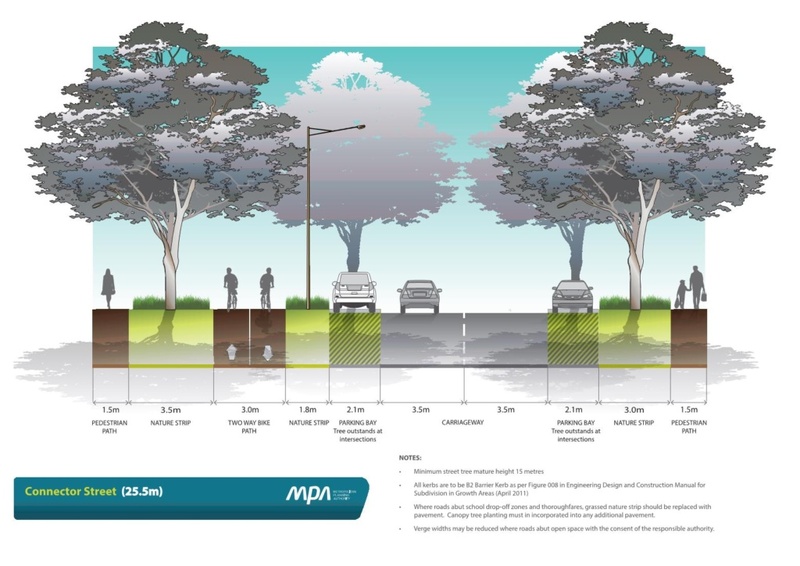 All current and new PSPs developed by the VPA will also have off-road cycle paths on all connector streets rather than on-road bicycle lanes. The existing 25m connector street width will be maintained – not increased. The VPA is currently consulting with stakeholders on “PSP Notes – Developing the Walking and Cycling Network”. PSPs are being designed to the 1.6km arterial road grid – in theory everyone is within 800m of an arterial road where direct public transport is proposed. The VPA have developed a new roundabout design that produces tighter roundabouts with the aims to keep in-estate traffic speeds lower and provide priority to pedestrians and cyclists (similar to Give Way signs) at a roundabout – as opposed to the current situation of vehicles entering and exiting a roundabout having priority over pedestrians. The new roundabouts will also take up less space. PTV confirms people will use the bus when it is direct, frequent, operates for a long period of the day and real-time arrival information is available to passengers. A bus service that is more frequent than 30 minutes should be established early into a new development – to establish early travel patterns and good patronage. PTV is more likely to commence bus routes earlier where new sub-divisions are permeable ie ensure direct and continuous short cut routes for pedestrians and cyclists to bus stops. PTV will push for new routes to commence faster when there is development around the full length of the proposed route. Incomplete connector roads prevent routes commencing. PTV is more inclined to establish a route that travels through an area rather than along the same road to enter and exit an area. Better bus stop infrastructure by developers can help encourage PT use. Better weather protection, accessibility including DDA compliance, potential ancillary services (eg bicycle parking racks) around bus shelters can be vital. What can be done? What is happening now? The VPA have indicated that subdivision designs should look at the intent of the PSP and planning scheme sustainable transport provisions. Move beyond a literal interpretation of guidelines as with existing common designs. Try more responsive designs. Council planners should be encouraged to move beyond literal interpretations of planning scheme provisions as with existing common designs (VPA feedback). Prioritise riding and walkability and public transport over car traffic where possible eg where roads are dead ends, only block off cars but not bicycles and pedestrians. Follow new VPA designs for collector streets, roundabouts and multi-transport solutions. Improve communication between Authorities and stakeholders. Chris Bright, Transport Planning Manager at the VPA is interested in talking more with developers. Public transport bus stops infrastructure should be improved and more attractive to users. Where possible co-locate bus stops with activity centres, shops or facilities. Public transport facilities at key destinations make land at these destinations more attractive and hence valuable. Subdivision development sequencing needs to support PTV’s stated feasibility criteria for transport. Consider alternative modes of motorized transport eg community mini-buses, mopeds and electric vehicle (EV) infrastructure. Many shopping centres around the country are already offering electric-vehicle parking bays with charge points. The capacity for charge points at travel destinations (workplaces, shops, houses, residential streets etc) may help to future proof new developments. Facilitate initiatives such as ride sharing – Uber etc – eg provide meeting points at bus stops with improved shelter and facilities. The Active Transport Victoria unit within Transport for Victoria has been set up within the Department of Economic Development, Jobs, Transport and Resources (DEDJTR) to promote the benefits of walking and cycling within Victoria.